Arron Services have a preferred Laptop & Netbook suppliers in HP & Samsung following years of experience with their high build quality products and support. However upon request we are able to provide a quotation on most major manufacturers. All laptops provided include the ability to conduct video & voice calls via the internet using the inbuilt Webcam & microphone. All laptops are selected upon customer’s specification of their use and may also be upgraded to meet the exact specification if required. 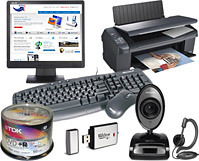 We are also able to provide a varying degree of peripherals including printers, backup devices and cases. All Laptops & Netbooks; include set up at our offices, delivery at home or at the office, setting up on your internet connection, transferring e-mail, transfer of all data & installation of printers if so required. All Laptops & Netbooks come with 12 Months Norton Internet Security Software supplied & installed. 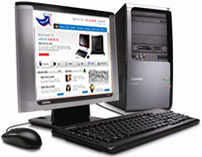 Arron Services' preferred suppliers of laptops and netbooks are HP and Samsung. This is because of years of experience working with their products. All laptops are selected to the customer's specification and we can also offer an upgrade service if required. We also supply peripherals such as printers, backup devices and cases.